Superheroes are all the rage these days, but if we really want to save the world, we need to look out for our tiniest friends — butterflies and bees. Bees are crucial to plant pollination, but they are in steep decline, which could spell disaster if it isn’t stopped. And butterflies, particularly monarchs, are threatened by the decline of their natural food source and breeding ground. For this reason, it’s important to promote the growth of native plants, which critters depend on to thrive. Thankfully, there are many guides about how to help. For example, a National Geographic article sums up how to help bees and other pollinators in our home gardens. The National Wildlife Federation went further and created an entire curriculum around gardening for wildlife. It includes a seven-part how-to guide for creating “Schoolyard Habitats.” This is not traditional gardening. It is creating and observing areas where native plants can thrive, and also providing housing for our winged friends. 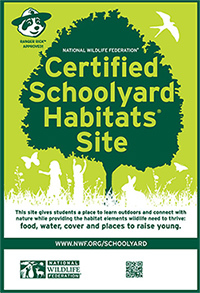 Resources include webinars on Creating a Schoolyard Habitat: How to Create, Maintain, and Teach in an Outdoor Classroom; Designing Your Schoolyard Habitat Project; and Summer Maintenance for Your Schoolyard Habitat. There are a wide variety of lesson plans, which include introducing students to the concepts of ecology, habitat card and species identification; exploring ecosystems within the United States; and introducing students to wildlife and wildlife behavior. The program includes three special initiatives: Butterfly Heroes; which helps kids save Monarch butterflies; a Native Plant Finder, which offers advice about native plants for your zip code; and how to make your garden a Certified Wildlife Habitat. Also offered are tools and resources for educators, which include ideas for where to get help for your schoolyard habitat in your community, how to become an Eco-School and the benefits; an environmental journalism competition for ages 13 to 18; a Trees for Wildlife Resources educational program; helpful links for educators; funding resources for educators; and partner resources from other organizations. Tagged nature-based lessons, outdoor learning. Bookmark the permalink.